At Alvin Hollis, we’re careful about the oil we provide to our customers’ homes. We buy only the highest quality oil and deliver to local homeowners from one of our four terminals located west and south of Boston. For more than 140 years we have been committed to providing convenient, reliable home heating oil deliveries. But that’s not all. Just as different gas stations charge different prices for gasoline, different fuel oil companies charge different prices per gallon for your home’s heating oil. Alvin Hollis is proud of our consistent record of delivering oil at prices below the state average. You can check the current average price at this Massachusetts government website. Our customers benefit from heating oil infused with “stay clean” additives and stabilizers to keep your tank and fuel line clean. And we offer a variety of convenient payment plans so you can select the one that fits your needs and your budget. Our oil tank replacement insurance policy is an optional program for customers who wish to avoid any unexpected surprises. If your tank falls into disrepair or fails, Alvin Hollis will quickly respond to replace it, helping to ensure that your family has a warm comfortable home again as quickly as possible. 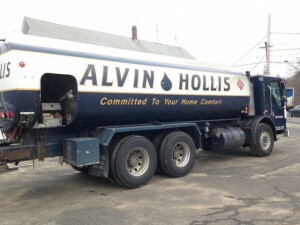 No wonder why Alvin Hollis supplies heating oil to more South Shore homes than any other company — and we’ve been doing it for over 140 years. Get a Better Home Heating Experience. Schedule an Appointment with Alvin Hollis Today! To get started on a new home heating oil account with Alvin Hollis, or to discuss your existing account, give us a call at (781) 335-2100 or fill out our convenient online contact form. For our customers who want the cleanest burning oil while helping the environment, we offer Sulfur-Free BioHeat Fuel, an ultra-clean, sulfur-free heating oil blended with biodegradable, organic materials. It’s so good we offer a discount on our service agreements for your heating system when you use BioHeat Fuel.